Photo: Masaru Goto / World Bank. Governments worldwide are preoccupied by the global financial crisis as they struggle to determine how to stabilize national markets and cooperate with other countries. Individuals too are distracted by the turmoil and will continue to be so, since the situation is certain to have far-reaching effects, whether or not one has a mortgage or investments. The director-general of the UN’s International Labour Office, Juan Somavia, last week said that the financial crisis may put 20 million more people out of work. “Long before the current financial crisis, we were already in a crisis of massive global poverty and growing social inequality, rising informality and precarious work – a process of globalization that had brought many benefits but had become unbalanced, unfair, and unsustainable,” Somavia said. 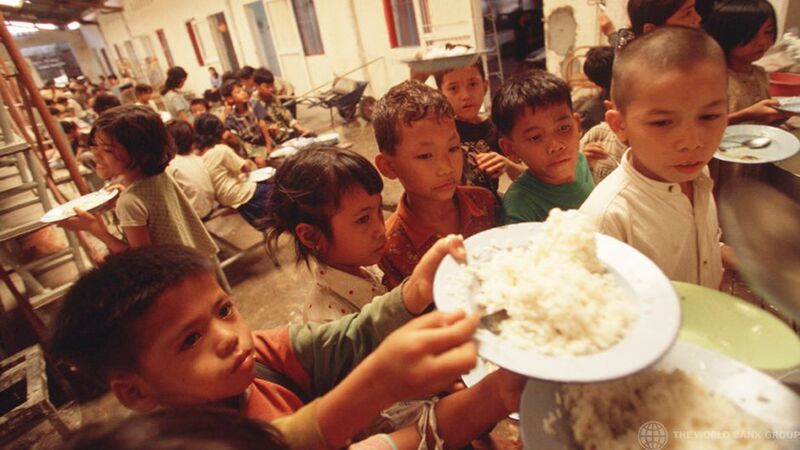 In this chaotic time, who is thinking of the over 900 million people who are now suffering from hunger around the globe? There is no denying that the globalization that enabled financial havoc to spread so rapidly has also played a role in worldwide hunger. Just a few months ago, rising global energy prices, the expansion of biofuel production and market speculation contributed to spikes in commodity prices that had aid officials predicting food insecurity for more and more people. Now, due to the financial crisis, food commodity prices have in fact normalized somewhat and oil prices are tumbling at an astounding rate. However, these price dips do not translate into more food for the world’s poor. The food crisis is affected by myriad factors — such as the cost of fertilizer, drought, etc. — and is not that easily solved. “There is no automatic correlation between what happens in the wheat futures market in Chicago and the price of wheat flour in Afghanistan,” John Holmes, a top UN aid official, told Reuters news service. The effects of the financial crisis on the oil market are also complex. With the falling prices, one might expect demand to again rise. However, in the US oil stocks have in fact risen, showing that consumers were reducing their consumption. “Many pledged new resources to bolster food security, to reduce deaths of mothers and children, and to put more children into school, among many other vital goals. These commitments are not a matter of charity, but an obligation in the pursuit of human rights for all,” she said. “The impact of the present turmoil, compounded by the food shortages and the effects of climate change, could very well derail the prospects of attaining the MDGs across the board,” Migiro stated at a UN meeting in Addis Ababa. Of course only time will tell whether his successor was listening. Neither of the two major presidential candidates in that nation — still the world’s largest donor country despite Bush’s 3.5% cut to the foreign aid budget in 2007 — have made concrete promises. Foreign aid will further become crucial as the crisis causes foreign investment to dry up in poor countries, as has already begun to happen in Africa, Liberian President Ellen Johnson Sirleaf told the Washington Post this week. So, just as there are calls for a new financial world order or a restructuring of the global financial architecture, it is also time to rethink and reconstruct the entire way in which the planet’s interconnection has been woven. For, in the same sense as columnist Thomas L. Friedman wrote recently regarding how a successful financial bailout needs also to be a green build-up, the world’s financial troubles cannot be solved without deeper change. “We need to get the balance right and concentrate on rescuing people and production. It’s about saving the real economy,” the UN’s Somavia said. Innovation and climate change by Carol Smith is licensed under a Creative Commons Attribution-NonCommercial-ShareAlike 3.0 Unported License. Based on a work at http://ourworld.unu.edu/en/hunger-and-poverty-overshadowed/.